School vacation week is winding down for us today (boo!) – but we’ve had a great ‘staycation’ at home this week! Actually, my husband Jack worked all week, but my seven-year-old and I had more time to relax… sleeping in every morning, seeing a Disney on Ice show with her Daisy Girl Scout troop, as well as some play dates with friends in between a few regularly-scheduled classes that were still held during this vacation week! And for me – not playing chauffeur to so many activities meant that I could spend some extra time in the kitchen! For me – that usually means baking and I finally got a chance to try this recipe for Sour Cream Coffee Cake Muffins! 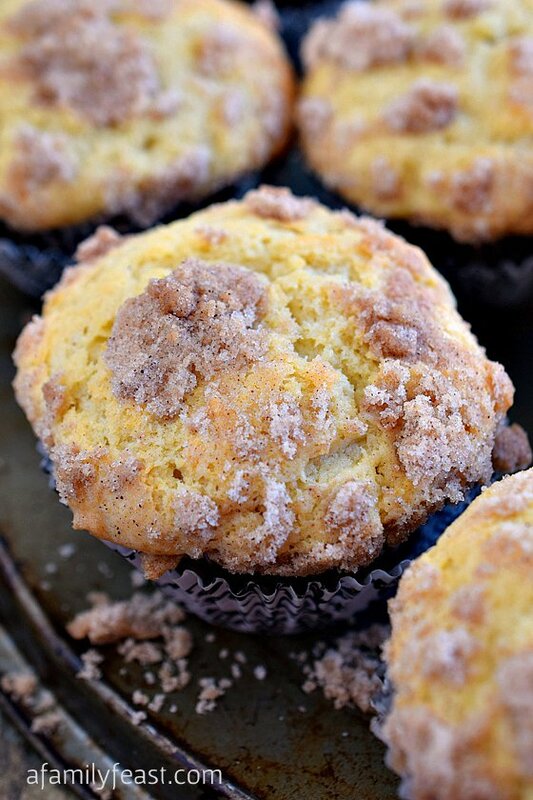 These sour cream coffee cake muffins have been on my to-make list for a while ever since I spotted the recipe here. 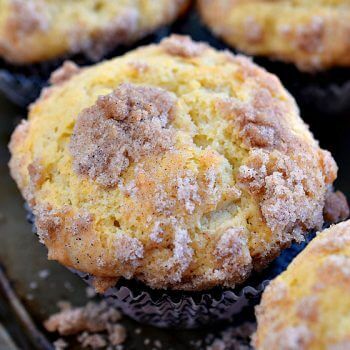 I love muffins with a sweet crumbly streusel topping, and with a cup of sour cream in the batter, I knew that these would be perfectly moist as well! I adapted the original recipe just slightly – adding more butter to the streusel mixture so that the topping would hold better to the top of the muffin after baking. 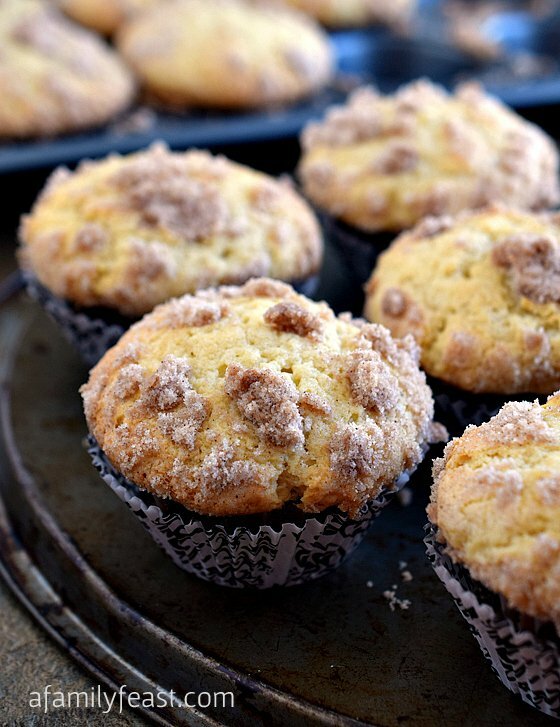 But otherwise, this is the perfect coffee cake muffin – not too sweet, filled with wonderful vanilla flavor with a sweet cinnamon streusel baked inside as well as on top! These muffins are a wonderful morning treat – and they freeze well too! So, even though we’ll be back to our busy lives next week, we can still enjoy these delicious sour cream coffee cake muffins for breakfast! In a medium bowl, add the dry streusel ingredients (flour, sugar and cinnamon) and stir with a whisk to combine. Using a fork or a pastry cutter, add the butter pieces and work into the dry mixture until well incorporated. Set aside. 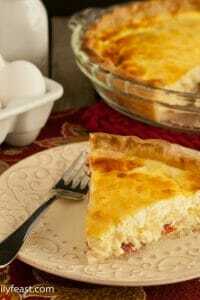 To make the batter, in another medium bowl, add the flour, baking powder, baking soda and salt and whisk together. Set aside. In the bowl of stand mixer, beat together softened butter, oil, and sugar and mix well. Add the eggs one at a time, mixing well after each egg is added. Spoon a heaping tablespoon of batter into each prepared muffin cup. Then sprinkle some of the streusel mixture on top of the batter. Divide the remaining batter into the muffin cups (spoon on top of the streusel layer) and then divide the remaining streusel over each muffin, sprinkling it over the batter. Bake for 15-20 minutes or until a toothpick inserted into the center of the muffin comes out clean. Remove the pan from the oven and remove each muffin to a wire rack to cool completely. I made these today, which is a snowy day. My whole kitchen smells like cinnamon, love it! We had them for a late breakfast with home made hot cocoa. This muffin is so good! The muffin looks delicious. I will try this week! Thanks for sharing. Martha. Thanks – We hope you love the muffins, Kathy! I just made these. 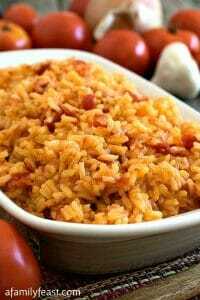 Very easy and really good. You can get more then 12 muffins from the recipe. Would definitely recommend this recipe. I just made these to send out with the family for early fishing. I was looking for an easy but good looking coffee cake muffin recipe. I always follow new recipes exactly the first time, and I did this one (I even read back through to see what I missed). However, my muffins had no dome and instead spilled out over the top of the tins. I am assuming I should have used my oversized muffin tin. As I had lot of batter left over after filling, I had a feeling I should have used a bigger muffin tin. I filled to just under the top because there was so much batter, rather than 3/4 full like I normally do. Bummed these didn’t turn out, as it was a waste of good ingredients. I am not an inexperienced baker, and honestly cannot remember the last time a recipe I tried didn’t turn out. If you used an over-sized muffin tin, you should state that in the recipe. Hi Sarah – I’m so sorry you had problems with the recipe – wish I knew what went wrong. 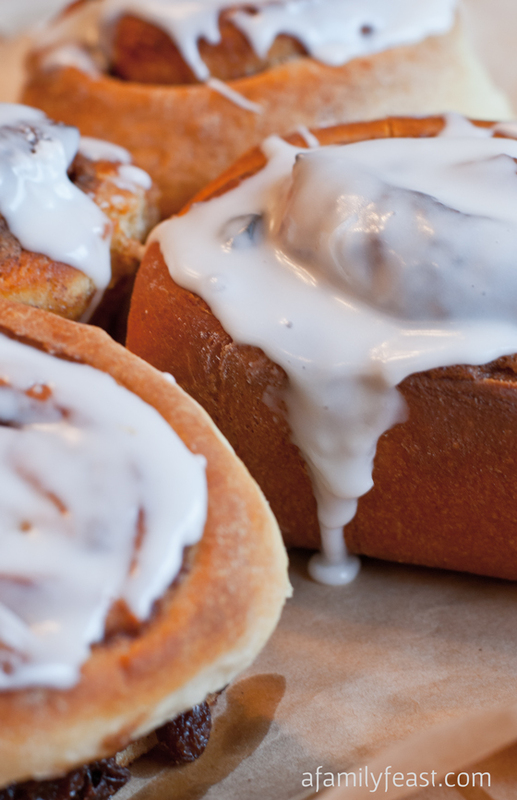 We used a standard-sized muffin pan (not mini and not over-sized/jumbo) when we made these. Having said that – if you click on over to the original recipe that we adapted for ours, she states in her recipe that she made 12 ‘jumbo sized’ muffins (although to me they look like the standard size in the photos). I remember the first time that we made this recipe (following hers) that we knew that we wouldn’t have enough batter to fill 12 jumbo size muffin pans – so went with the more common size. Either way, I’m sorry you were disappointed in the recipe – I hope the recipe wasn’t a complete waste for you. Thanks for taking the time to share your feedback. Loved the Sour Cream Coffee Cake muffins. They freeze beautifully. The only change I made was to substitute the oil for unrefined organic virgin coconut oil and they were delicious. 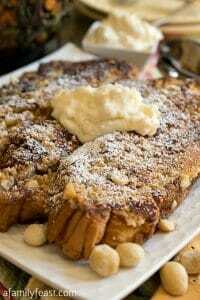 Being a native New Englander(living in Texas) next on my list is your New England Apple Cider Cake. It looks wonderful!! Great idea Sherry! We’ll have to try swapping in the coconut oil the next time we make the muffins! 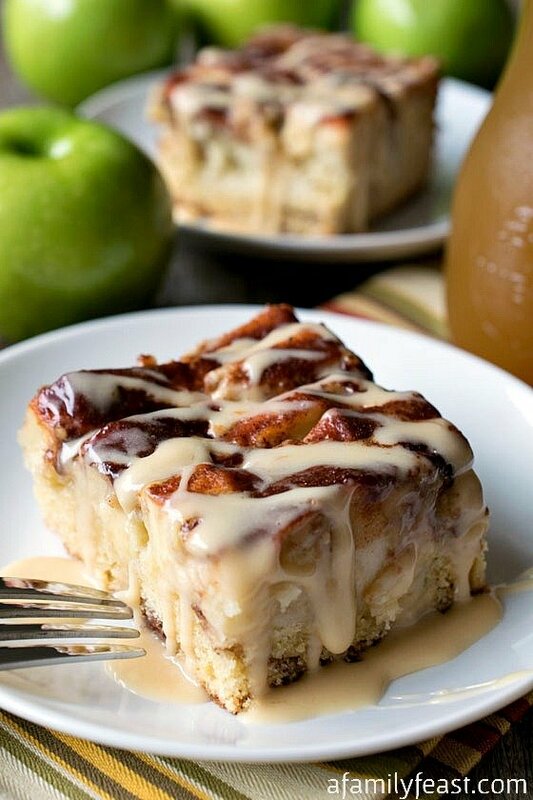 Hope you enjoy the Apple Cider Cake too! How long would I bake these if I used an oversized muffin pan? 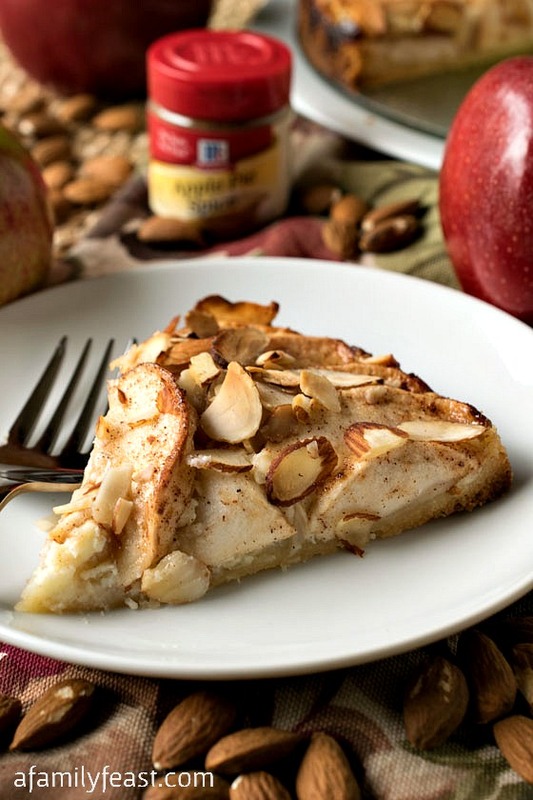 Hi Marybeth – I haven’t made these in an oversized muffin pan myself. But here is a helpful chart from Wilton: http://www.wilton.com/cupcakes/making-cupcakes/batter-amounts.cfm This is specific to cupcakes and cakes but the timing should be fairly close for muffin batter as well! Hope this helps! Hi Andrea – I’m sorry, I never tried it as a loaf bread. It might work – please let us know if you try it! It worked beautifully, about 40 minutes at 350. Thanks. I was looking for a pumpkin coffee cake recipe, this sound like it’s very adaptable. I will try it and get back to you! Sounds great Andrea! I’d love to hear how it comes out with the added pumpkin puree! What a great idea Andrea! I’m going to try that myself! 🙂 Thank you for sharing! these muffins sound delicious. Do you think I could add some fruit, e.g., cherries or apples? TIA! Hi Tina – Yes – I’m sure you could add some fruit. You might need to adjust the cooking time since the fruit will add some extra moisture – but it should work! Glad they were a hit Gwen! 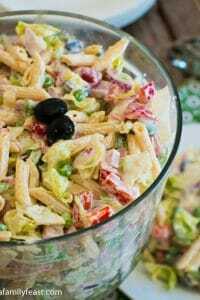 (And yes – definitely make a double batch the next time!) Thanks for writing to us! Hi Julianne – Yes – we’ve frozen them! 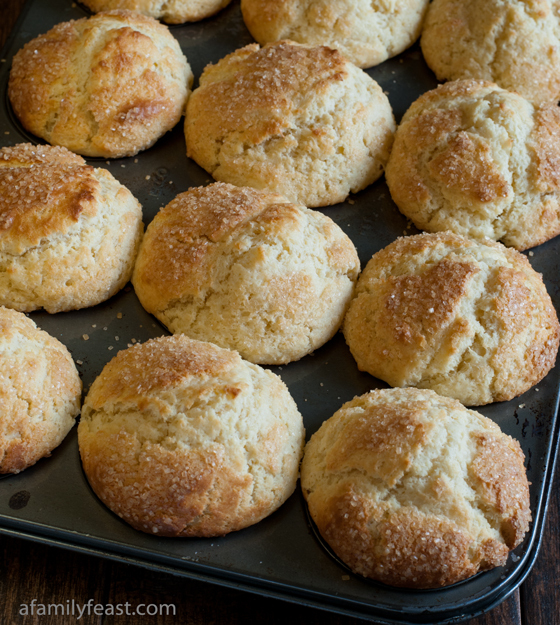 Like any baked goods – these are best fresh out of the oven, but they were still delicious after freezing them! Can I double this recipe and do I use a standard-size cupcake pan or a muffin-sized pan? Hi Christine – Yes – we baked ours in standard size cupcake/muffin pan. And sure – you can double the recipe and it will fill two pans. Hi Susie – Yes – batter then streusel then more batter and a final sprinkle of streusel on top! Hope you enjoy the muffins! A friend of mine made these and they were simply wonderful! I would like to make them in a cake pan but I’m wondering what size and for how long shall I bake them? Hi Joanne! I haven’t made these in any other form – just the muffins so I can’t say for sure. The recipe I adapted (link in the post) suggested a loaf pan or even a bundt pan could be used – but she didn’t specify how long to bake it. If you try it – please let us know how it worked out! Do you have any suggestions on how to make these healthier? You could use low-fat sour cream to reduce some fat and calories without changing the recipe too much. You can also use apple sauce in place of the oil. I would recommend using some applesauce in place of the oil and maybe increase the butter by 1 TBS. You could also use half (or all) whole wheat flour. Both of these options would definitely make it more heart healthly!! 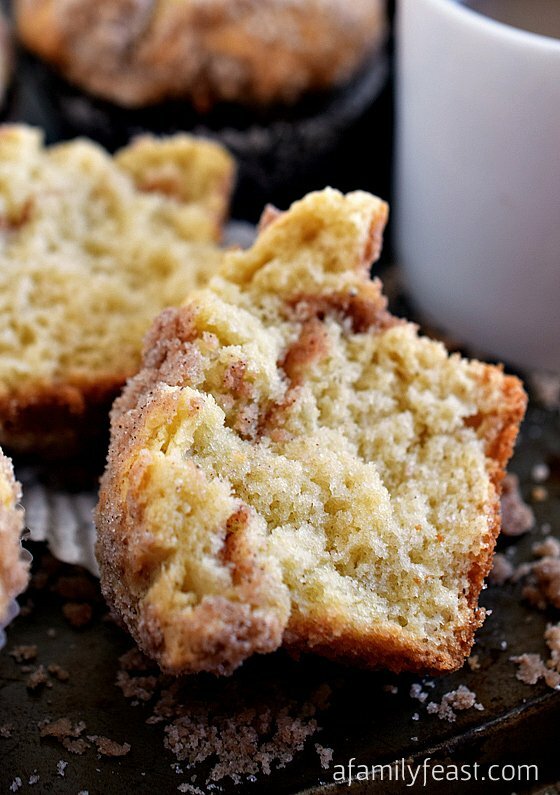 I love coffee cake – and to put them in a muffin makes so much sense! Yum! Thanks Kristi! Have a great weekend! I make a muffin very similar to this and they are delicious! I love when I have extra time in the kitchen to bake! I find baking very therapeutic. 🙂 I’ll definitely check out your recipe Kathy! Thanks for visiting us today!